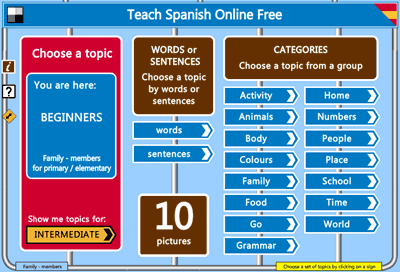 When you start Teach Spanish you begin by selecting a topic - this can either be a primary / elementary topic with 10 items of language, or a secondary / intermediate topic with 20 items of language. Having selected your topic, you must select a first teaching module - either an activity, a game, or, in preparation, a utility. 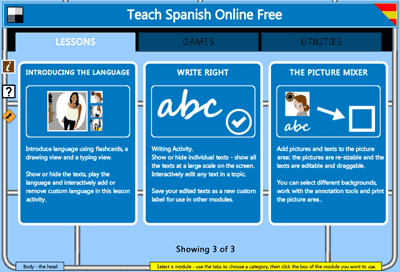 Language in Teach Spanish is organised into topics which are sets of related items, each consisting of a picture, a text and an audio recording. Primary topics have 10 items each, and are grouped thematically. Secondary topics have 20 items each, and are ordered alphabetically. On the topic selection page, you can choose to view the primary topics or the secondary topics.